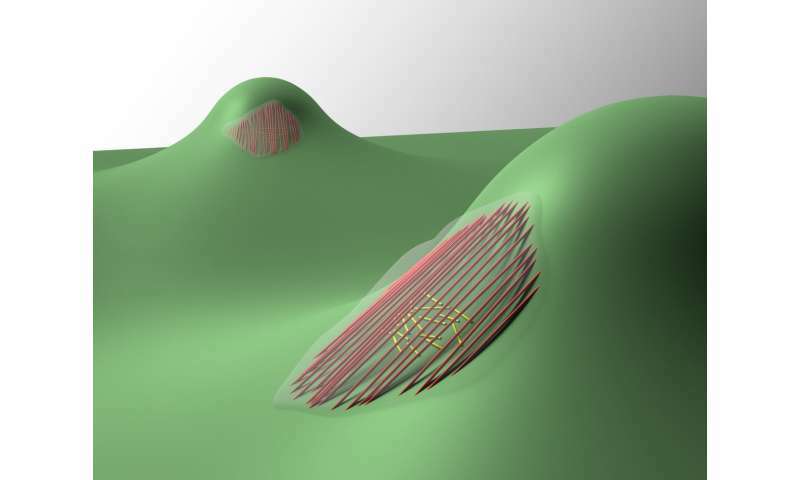 Last year, researchers from the University of Pennsylvania revealed surprising insights into how cells respond to surface curvature. Specifically, they investigated how cells respond to cylindrical surfaces, which are common in biology. They found that cells change the static configurations of their shapes and internal structures. "We think of it as the cells doing calculus; the cells sense and respond to the underlying curvature," says Kathleen Stebe of Penn's School of Engineering and Applied Science. Now, the researchers, led by Stebe and recent engineering graduate Nathan Bade in collaboration with Randall Kamien of the School of Arts and Sciences and Richard Assoian of the Perelman School of Medicine, have published a follow up study that Stebe likens to "calc III" for cells, investigating how cells respond to more complex geometries. The research, which could enable new tools in biology and affect how physicians treat things like vascular disease, has been published in the Biophysical Journal. The researchers created a surface other than cylinders that they refer to as a "sphere-with-skirt." As the name suggests, the upper portion of the surface is spherical, but, as one travels farther down the surface on either side, it forms a skirt that is saddle-like in shape. Because of this, the surface has two non-zero principle curvatures at every point; the spherical portion has what's called positive Gaussian curvature while the skirt has negative Gaussian curvature. "We gave this really interesting little mountain to the cells," Stebe says, "and said, What are you going to do with this smooth mountain that gives you these different curvatures? And it turns out these cells are really clever. They not only change their shapes and internal structures, but they move in dramatically different ways that open new questions about how cells move." Cells on stiff surfaces form stress fibers, comprising actin and myosin motors. In the previous study, the researchers found that, surprisingly, on a cylindrical surface the cells actually bend some of the stress fibers along the direction of maximum curvature. Although one population of stress fibers located above the cell's nucleus aligned along the cylinder axis, another one under the nucleus wrapped around the cylinder circumference. They also found that, by manipulating the ctyoskeleton of the cells, they could recapitulate the alignment pattern of the cytoskeleton that they saw in vivo. In this most recent work, the researchers found that, again, the population of stress fibers above the nucleus remained as straight as possible and then beneath the nucleus a second population wrapped in the direction in which they're most bent. Just as in the previous research, the two populations aligned along the two principle directions of the surface. To investigate this, Bade coated the sphere-with-skirt with molecules to make it adherent to cells and then watched how the cells behaved when they migrated on the surface. The researchers used a powerful confocal microscope that provided three-dimensional information about the systems. The researchers were able to treat the stress fibers, a component of the active cytoskeleton within the cells, so that they would fluoresce. Using a laser to collect light from very small sections of a sample, the confocal microscope eliminated all the out-of-focus light. This produced a high-resolution image from a narrow plane which allowed the researchers to see that, just as in the previous study, one population found a way to stay as straight as possible and the other found a way to bend as much as possible. "The apical stress fibers that wanted to remain as straight as possible found a way to remain straight by forming bridge-like chords over the concave gap," Bade says, "The basal stress fibers wrapped around the feature and were very bent." The researchers then studied the orientations of the two stress fiber populations as a function of the surface curvature. They discovered that cells experiencing the weakly curved portion of the surface didn't have any preferential orientation for their apical stress fibers, but those facing the more challenging curvature very strongly oriented their apical stress fibers, pointing towards the center of the feature. This opened the question of what sort of impact this has on important cell behaviors. "Cells see these kinds of boundaries and surfaces in our bodies," Bade says. "Glands and vessels have the types of curvature fields that we have captured in the sphere-with-skirt surface. Some types of tumors also have these complex curvatures. Curvature is everywhere. We're not made of planes." According to Bade, this research shows that these geometric cues have profound impacts on organizing the cytoskeleton, which is important for cell behaviors such as migration, how cells move around in our body. "We wanted to find how the sphere-with-skirt geometry would influence cell migration if it did at all," Bade says. "We saw that the cells would migrate up the skirt, but, as soon as they found the spherical cap, they actually stopped migrating in the radial direction. The cells explore this cap, but they refuse to migrate onto it. This is effectively a region of curvature repulsion to the cell. The cells actually change their polarization; you can see them turn almost 90 degrees and begin migrating around the feature." Bade and Stebe believe that curvature might actually be altering the relationship between the direction in which stress fibers are oriented and the migration direction. This suggests that the apical stress fibers, which usually lead migration, decrease in importance, and the basal population takes over. "On planes, the apical stress fibers are always in charge of driving," Stebe says, "but all of a sudden the basal stress fibers grab the wheel. This leaves a lot of open questions. It's one of those really exciting pieces of work because the results are so clearly evident in the data, but the mechanisms are not trivial at all. It's really exciting that posing an apparently naive question can pull you into a space with great open questions and that the clarity of the data, the significance of the results, the way that the cell absolutely obeyed these cues were breathtaking to me." According to Bade, understanding tissue stiffness and its role in changing cell behaviors has had dramatic implications on health care and how researchers approach diseases like cancer. This new work suggests that curvature fields visible to the eye are also an important cue. Keeping that in mind while looking at disease states, Bade says, might influence how people understand things such as vascular disease. Stebe says that the questions that this research opens up may pave the way to new tools in biology. "In science and engineering, once we know we can organize something, we can find a way to use it," she says. "So for example here, there are interesting questions about how the nucleus interacts with the surrounding entities within a cell. And now we have two nice ways to confine the nucleus- under stress fibers on cylinders, which squeeze the nucleus, and under the chords that envelop the nucleus without compressing it. These results are interesting to fellow researchers, who can help us reach further into biology to ask about the implications of these effects in gene expression and cell fate."